This week’s pose is Dandasana. Danda = Staff or stick, Asana = Posture/pose. 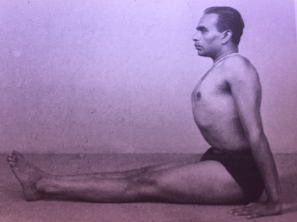 It’s one of the first seated poses taught at Yoga Path. With the floor beneath your legs gives you the opportunity to press down the back of your legs, to create an upward lift through the torso. However, the tightness in your hamstrings and buttock muscles pull you down. Then the struggle starts. You’re stuck between being pulled down, as you have to work against gravity to create a lifted torso. Sitting on a folded blanket or foam pad can help. Once achieved, the lungs can move freely and that inner space gives you opportunity to take a deep inhale. The action of the lungs moves the chest from the inside. There’s an internal expansion. However, essentially Dandasana is a transition asana. This means that what we learn and create in Dandasana takes us to other poses. It can take us to forward bends, or even a backbend; Purvottanasana (east side of the body stretch) or an abdominal pose; Navasana (boat pose). Then we return to home base again. Like how Tadasana is used to bring us back, centre ourselves, find balance, find the breath and find yourself. A transition forward and transition back. All the while grounded, yet looking for change.